The rules of the competition were simple: form a team, elect a team captain, and record team members’ steps each week. The team with the highest average number of steps wins! The ultimate prize for the winners was chair massages for the entire team. As somebody who sits at a computer much of the day, the chair massage was enticing enough for me to form a team at ICH. Within a day, 16 ICH staff members agreed to take on the challenge. Each team member received a welcome kit containing a pedometer, brochure, and a bracelet, which said “Goal: 10,000 steps a day”. Initially, I thought the competition would be easy: “I walk plenty each day, how hard could this competition really be?” Oh, how wrong I was. It wasn’t until I strapped on a pedometer that I realized how little activity I actually do throughout the day. 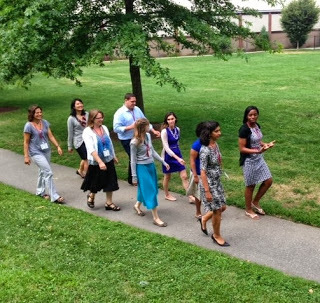 The team definitely needed to get proactive about increasing activity levels throughout the workday, so we made efforts to ensure we were walking whenever possible at the office. With the Gold Star Mothers Parklocated right next to ICH, it was the perfect place for walking meetings or even just grabbing a coworker for a short walk to take advantage of the beautiful summer weather. At the end of the six weeks, Team ICH had a combined total of 5,978,944 steps! All the teams’ steps were tallied and the results were in….ICH came in second place. Even though we didn’t win the ultimate prize, the competition was a great venue for ICH staff to remember the importance of taking a few minutes each day to go outside, walk and be active. Additionally, it helped promote the concept of walking meetings instead of moving from one seat to the next. Changing office culture takes time, but this competition helped remind us all that as public health professionals we must take initiative and do the same activities we promote in the community.